“I am not sure that the necessary critical examination of the fall of Goma into M23 hands in November of last year was ever carried out,” he said. Marie O’Reilly: I’m here today with Arthur Boutellis, research fellow and an advisor to the Peace Operations and Africa Programs here at the International Peace Institute. Arthur, thank you for speaking with us on the Global Observatory today. A UN peacekeeper was killed and seven were wounded in eastern Congo on Wednesday when M23 rebels fired at the UN position. 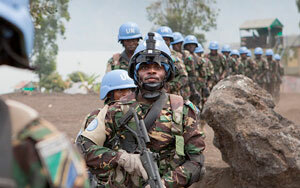 With its new, more aggressive Intervention Brigade, has the UN become a party to the conflict in eastern Congo? Arthur Boutellis: If and when peacekeepers engage in combat operations, as it has over the past few days in eastern DRC, then yes, UN peacekeepers are a party to the conflict. Basically, International Humanitarian Law distinguishes between those who are taking part in the hostilities and those that aren’t. In most missions, UN peacekeepers do not engage in fighting, and it is considered a war crime to attack UN blue helmets. However, when and if UN peacekeepers do engage, then they become a party to the conflict. Looking at the Intervention Brigade in Congo, some experts would argue that UN peacekeepers in eastern DRC have been a party to the conflict in the past already. And, under Chapter VII, and particularly since MONUC and MONUSCO started supporting the Congolese Armed Forces, FARDC, military operations in 2009, there were instances where UN peacekeepers became a party to the conflict. The other question is now, what are the implications of this? Under International Humanitarian Law, the main implication is that peacekeepers become legitimate targets. The M23 rebel group has made statements to this effect; and some of the other MONUSCO troop-contributing countries [TCCs] that are not part of brigade have also expressed some concerns. Of course, it also raises other questions. In terms of UN responsibility, what if the brigade kill civilians in the course of operations? Or, what happens if they capture rebels—should they transfer them over to the Congolese authorities? These are questions that apply to any fighting force under international humanitarian law. MOR: Speaking of civilians, part of the impetus behind the more robust Intervention Brigade was to ensure that civilians would be better protected. But, last weekend, we actually saw several civilians were killed by mortar shells in residential parts of Goma. Can UN peacekeepers live up to the expectations when it comes to the protection of civilians? AB: Let me first challenge this question a bit. Because it is true that the Intervention Brigade, made of 3,000, troops, indeed shares the responsibility for the protection of civilians (POC) and the mandate of the larger UN mission in Congo, made of 17,000 troops, the brigade itself is not just the result of trying to learn from past protection failures. And I think this is part of the problem. I am not sure that the necessary critical examination of the fall of Goma into M23 hands in November of last year was ever carried out. The real impetus, if I may say, behind the Intervention Brigade was the inability of MONUSCO peacekeepers in support of the Congolese troops to prevent the fall of Goma. But the Intervention Brigade—although now it is a part of the UN mission in Congo—was not a UN idea initially. As a matter of fact, I think it is important to recall that the genesis of the Brigade was with the regional initiative of the Great Lakes region, which basically in July 2012 decided the “immediate establishment of a neutral international force to eradicate M23, FDLR and all other negative forces in eastern DRC.” At the time it didn’t even mention the UN. Basically the idea was to set up an African force in parallel. Then the African Union supported the idea of having essentially a peace enforcement brigade. But the UN decided it was best to try to incorporate this brigade within the existing MONUSCO in order to not have parallel chains of command, a parallel force operating while there would be peacekeepers there is well. On the last part of your question, I think it’s a big question about the protection of civilians, and I’ll just make one comment here. Clearly, it has been difficult for the UN to live up to its physical protection of civilian mandates. Now, the POC mandates that peacekeeping missions go way beyond only the physical protection that armed peacekeepers can provide—there’s a three-tier approach, the POC approach of the UN also includes facilitating the political process, creating a conducive environment. So all other activities that are multidimensional, the UN peacekeeping operation carries out, from security sector reform, promoting the rule of law, promoting human rights, DDR, all of these contribute also to the protection of civilians in a broader sense than only the physical protection of civilians under immediate threat. MOR: What’s going to happen if the peacekeeping mission sustains more casualties of its own—are they going to pull out? AB: First of all, it is not the first time that MONUSCO has used force. It’s not the first time that it has used its attack helicopters against the M23 and other rebel groups in support of the Congolese forces. And MONUSCO has also lost peacekeepers in the past. You’ll recall in July of last year, an M23 attack killed one UN Indian peacekeeper. This has not resulted in any talks of the UN pulling out. What’s new with this last incident of the Tanzanian soldier killed yesterday is that it is part of the new Intervention Brigade that is commanded by a Tanzanian general. The Intervention Brigade (IB) was reacting to the shelling of Goma, so under a protection of civilians mandate, and, as for any new force, I think it was expected that the Brigade would be tested sooner or later. Of course, the IB and its mandate have increased expectations from the Congolese, and is putting the UN in a hard place. Because, of course, a UN peacekeeping force and the troop-contributing countries behind it and the Council are not necessarily ready to sustain heavy casualties. But for now, we haven’t seen this. Yesterday’s incident is taking place in a context where you have rising tensions between Rwanda and Tanzanian presidents since the last AU summit. And here it gives me an opportunity to say that I and other experts have seen that the real strength of the brigade is not its military capabilities that are somewhat limited—and the brigade is not actually fully operational, as they’re still awaiting some soldiers from Malawi—but the real strength is not necessarily its military strength, but rather the fact that it is a regional force, and that it could bring with it the political weight that troop-contributing countries from the region could bring alongside its troops, and this political weight could also be going towards a regional political solution, which would address the root causes of the conflict. MOR: Thinking about UN peacekeeping more broadly and some of the changes that were seeing, does the Intervention Brigade, and MONUCSO’s work more broadly in Congo, signal a permanent shift from “keeping” the peace to “enforcing” the peace? And again, because it wasn’t really conceived as a UN brigade initially, and rather it was a sort of a creative way to incorporate what was initially an African idea for a peace enforcement force within the framework of MONUSCO. So, I don’t really believe it is a trend, and probably the testing of the brigade over the next few months will also tell us more about the direction. The brigade was never going to be a silver bullet. I think the primary purpose was to create a bit of space for the political negotiations that are taking place between the government of Congo and the M23 in Kampala, but also for the larger regional process, under the regional framework agreement [otherwise known as the Peace, Security, and Cooperation Framework, PSCF] that was signed in Addis in February. The bottom line here is that peacekeepers and use of force, whether part of a brigade or just as part of the mandate under Chapter VII of the UN charter, which allows you to use force already in self defense, but also in protection of the mandate—this mandate will never substitute for a political strategy, and that’s the key lesson from the past. And this has been said already in the Brahimi report in 2000, is that, while limited tactical use of force by UN peacekeepers can be useful in some contexts and play a deterrent role and open space for negotiations, the UN peacekeeping machine is not a fighting machine. And will never be so. MOR: Arthur thank you so much for sharing your insights with us today.